Amazon has unleashed some pretty ambitious stuff in the last couple years. It's been opening brick-and-mortar bookstores across the country, producing a whole bunch of exceptional movies and TV shows, and will soon debut a bonkers new grocery store concept, where customers can simply walk away with whatever they want without waiting in line to check out. However, these may all end up looking like quaint little side projects if a patent recently granted to the company is any indication of what's to come. That's because it appears Amazon may be hatching a plan to develop floating warehouses that would deploy an army of drones to deliver orders to customers, direct from the sky, minutes after they click "buy." Talk about a hell of a Prime perk. The approved patent, originally filed back in 2014, outlines the concept of an "airborne fulfillment center" serviced by unmanned aerial vehicles (drones! ), which could theoretically pluck parcels ordered in real time and deliver them to the customer in a matter of minutes. 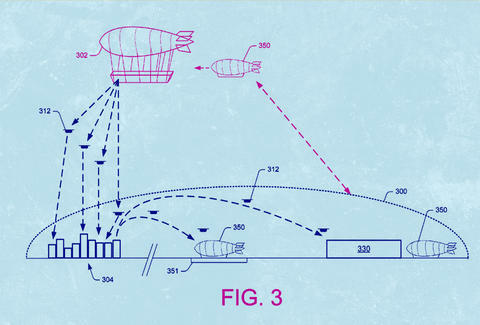 So as not to loom over us like some creepy mothership, the product-packed vessels would float at an altitude of 45,000ft, well above commercial air traffic and but a blip in the sky to the naked eye, the patent application explains. It also explains how having goods delivered from above would conserve energy, since the drones would require little to no power -- only enough energy to stabilize and direct them as they descend naturally from the sky -- as opposed to ground-based drone deliveries, which would involve having to both take off and land every time. The vessels wouldn't necessarily need to land to replenish stock, either, but would rather receive periodic deliveries via smaller airship "shuttles." 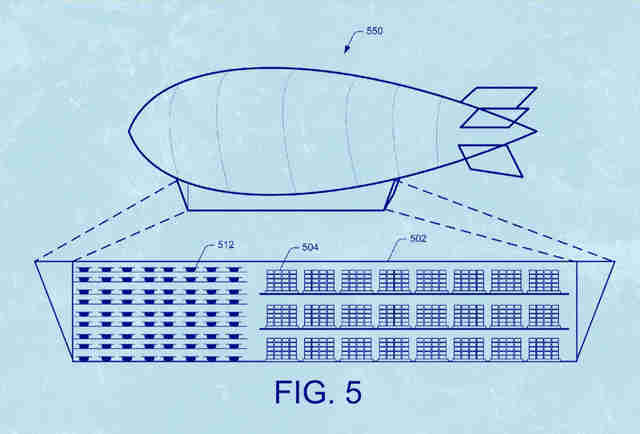 Presumably, the primary reason for this type of system is efficacy, but the patent details some other interesting ways in which a floating blimp full of products might be handy. For one, it could hover above certain large-scale events (think an NFL game or music festivals) and be stocked with goods specifically tailored to the crowd below (merch, snacks, booze, etc. ), which individuals could order via their phones. It could also serve as an innovative advertising or marketing tool, flying around at a lower altitude broadcasting a particular product on its exterior, then distributing said product to anyone who's interested down below. Of course, unleashing this sort of complex aerial system would require a whole lot of approval from aviation authorities, and would likely run up against a bunch of restrictions. And to that end, it's unclear whether Amazon has any intention of legitimately pursuing this in the first place, or is simply hedging its bets for the future. However, considering the company is already actively testing a drone delivery program in the UK, and has successfully revolutionized how the world at large buys and receives its stuff, it may be wise to wait a bit before writing this whole thing off. Joe McGauley is a senior writer for Thrillist and can't wait until two-day shipping is considered egregious.